This is a set of mods that you can combine to tweak the Gift Pile. You can mix and match these mods anyway you like, and they are all compatible with my Buyable Bunch o' Gifts mod. Require The Sims 3 Seasons Expansion Pack. Built with patch 1.42 and will not run on any lower patch level. Due to their simplicity, these mods may not necessarily require an update after major patches. It’s always best to check in, though. EA hides the Add Gift interaction for Player Sims. 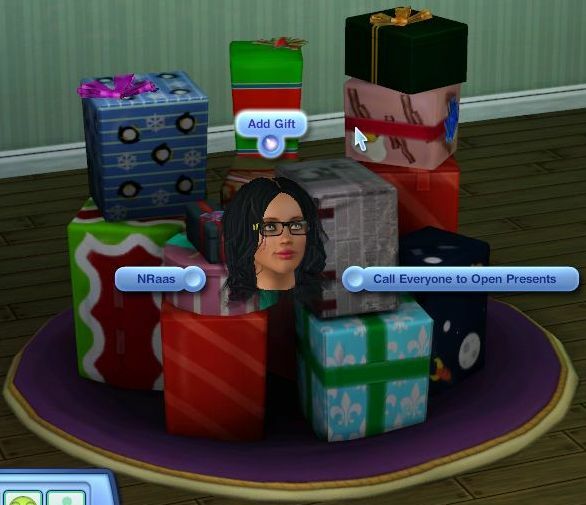 This mod unhides the interactions so that you can direct your sims to add a gift to the pile. You have no control over what gift is added, as the gifts sims receive are randomly generated during the Get Gift interaction. Your household is not charged for adding gifts to the pile, so this mod can be very cheaty if not used with discretion. This mod will conflict with any other mod that alters the AddGift_GiftPile ITUN resource in the GameplayData.package. I do not currently know of any other mods that will conflict with this mod. By EA tuning, the gift pile comes with 8 gifts. This sets the initial gift pile size to 14. This mod will conflict with any other mod that alters the GiftPile_0x4a0eed495250ccf2 XML resource in the GameplayData.package. 'Tis the season! Sims will actually have fun while watching other sims open their gifts. Update: Also added social gain to the interaction. This mod will conflict with any other mod that alters the WatchOpenGift_GiftPile ITUN resource in the GameplayData.package. Please report any problems that you encounter with this mod. If you'd like any other flavors, feel free to ask.